Everybody knows that gilded stuff is the best, from an Age of incredible economic opportunity, to a cage so incredibly luxurious no woman even wants to know what's outside, even if it's more diamonds. Gilding your nightlife, Doré Lounge. 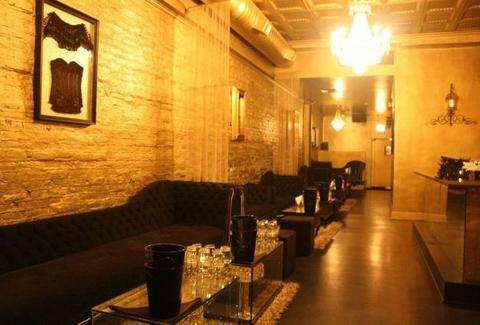 Named after the French term for gold, DL's a dimly lit lounge that's loaded with it -- gold-upholstered parlor chairs, gold accents on the elaborate crystal chandeliers, and gold-brick walls dotted with portraits of Victorian ladies and framed corsets, which're no longer a Victorian secret. Specialty cocktails are at the forefront, including the Port of Orleans (bourbon, simple syrup, St. Germain, Angostura bitters), a citrus-vodka-basil combo called the Garden of Eden, and a Champagne/lemon-infused Veev Acai concoction sprinkled with gold flakes called Cash for Gold, a particular favorite of MC Hammered. Nosh-ables are equally classy, from light bites like shrimp-havin' yellow tomato gazpacho shooters, to warm goat cheese crostini w/ maple bacon, to caramelized shallot-sauced coffee-crusted lamb loin with toasted almonds and candied orange, whose sweetness holds lots of a-peel. Of course those who've taken advantage of incredible economic opportunity themselves can snag a low slung black couch along the back wall for bottle service, which includes jeroboams of Veuve sure to impress the ladies -- wait, who let them out of their awesome gold cages? !